BoyRaket.com: MOTOLITE to the RES-Q! 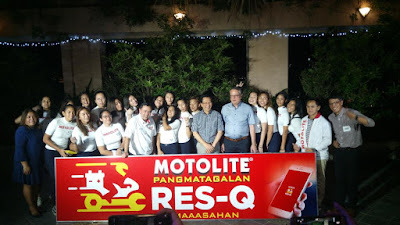 New innovations come to the rescue at times of emergency nowadays as Motolite launched its emergency on-the-go mobile app RES-Q on Thursday evening at Quezon City. The known car battery brand also unveiled its newest brand partners in one of the recent big names in college volleyball, the Ateneo Lady Eagles. The RES-Q app is Motolite's more modernized take on approaching customers who are in dire need of immediate solutions to its car battery problems – that's of course aside from the usual Motolite Express Hatid. The on-the-go service aims to give motorists the peace of mind that when it comes to car troubles, someone always has their back. Now taking an alternative from the usual hotline call, all it takes for users is to launch the app. And with just a few clicks, help is on its way – that easy! The Motolite executive also said that Motolite battery installed in your vehicle, the RES-Q service will be free of charge. Motorists will only need to pay if a new battery is needed or in certain cases such as coolant or fuel, and they can pay either by cash or credit card. “In some aspects, that's better than paying for roadside assistance club annual membership dues,” added Chan. Meanwhile, the app launch featured the entire roster of Motolite-Ateneo Lady Eagles, with the notable all-around player Kat Tolentino, on the spotlight. After suffering two ACL tears in the past, the 6-foot-2 Fil-Canadian relied on her determination and passion for the sport and eventually managed to get her team in making the Premier Volleyball League (PVL) Championship glory at least a step closer to their hands – thanks to her towering presence on the defensive end. That's aside from her strong commitment to her studies. But just like Tolentino's defiance among setbacks en route to the Lady Eagles' impressive run, the Business Management student has been a living testament to what Motolite can be of help in times of need, especially the Express Hatid service. The ADMU's women's volleyball team has solidly stomped its foot on the recent scene; making them a force to reckon in the sport after making it to the semifinals of the Premier Volleyball League Season 2 Open Conference. However, Ateneo head coach Coliver Altamirano said making it to the semifinals is just an added bonus, considering they have a relatively-young roster among their colleagues. “Well first when we joined this tournament, we didn't really expect anything. We just want to play,” said Altamirano, who praised Motolite for its support that has truly inspired the players and coaching staff.